Want to Learn How to Use Social Media for Your Market Research Efforts? 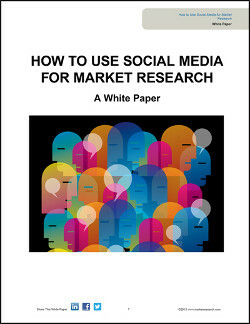 A white paper detailing how social media platforms and social networking can be effectively utilized by market researchers. By the year 2017, nearly 2.5 billion people across the globe will be engaged in social networking. With this rapid progression, it is becoming increasingly important for market researchers to take advantage of the unique networking opportunities social media provides and the data that can be collected on target markets through social media. How the evolution of social media is changing the market research landscape. Which social channels can be most effectively used by market researchers and which key functions will be the most beneficial. How to efficiently use social media to network with other market research professionals and gain increased access to high quality market research. How established corporations have effectively utilized social media to enhance their market research efforts.